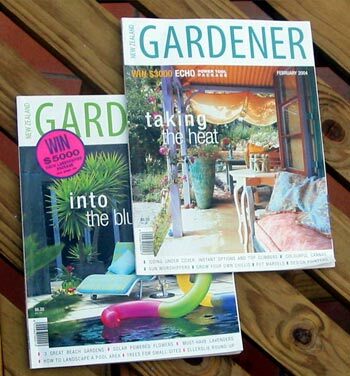 This is the national magazine for general gardening in New Zealand. It has been published continuously since 1944! New Zealand Gardener has a variety of styles and attitudes, and sometimes seems confused - should it be a light read by the coffee table or an inspiring and informative experience? There are articles and contributors whose writing I really enjoy (Barbara Lea Taylor, for one). Since I have a large garden I am more interested in the real outdoors than cute courtyards with contrived designs. So many of the magazine's articles are probably wasted on me. And I do have a built in barrier against garden designers, which this magazine loves to feature. Then I will discover a wonderful article with depth and absolutely no sales-pitch (for example on the use of New Zealand natives for hedging) and all is forgiven.